Do you go on a lot of hiking and camping trips? Are you constantly looking for the best way to keep your water clean and safe to drink? Do you want to find the perfect solution that won’t take up a lot of room in your backpack? If any of these are true, you need the best water purification tablets on the market to help you make the most of your camping and hiking trips! In this article, you’ll find information about these tablets including what they are and how they work. You’ll learn all about the top 5 tablets on the market today, and you’ll even get a few tips to find the perfect ones to suit your needs, too. Everything you need to know about water purification tablets is listed below. So let’s get started! 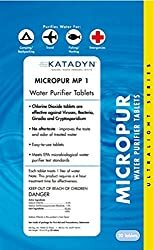 2 What Are Water Purification Tablets? 3 How Do Water Purification Tablets Work? Technically, water purifying tabs have been around for a long time. They were once used during war time to help soldiers have access to clean water, and they’ve been given to people in developing countries for decades to help supply them with fresh drinking water. This is one of the many types of portable water filtration systems available to the public. They are small and easy to carry, and they kill bacteria, some types of parasites, and other pathogens that can be found in drinking water. Whether you’re hiking, camping, traveling to another country, or dealing with the aftermath of a natural disaster, these tablets are a great way to be sure you have plenty of drinking water that won’t potentially cause you to become sick from a waterborne illness. Note that chemicals and physical debris (like dirt) can’t be removed from water with these tablets. Although there are a few different kinds of water treatment tablets available on the market today, they all work pretty much the same way. They usually contain one of three substances: iodine, chlorine, or chlorine dioxide. There’s not a big difference in these three, although some may have a stronger and less pleasant taste than others. Tablets are normally placed in water and left for a while to let them do their job. Depending on the type of tablet you get, the amount of time you need to wait may vary. Be sure to check the enclosed instructions to use your tablet for the right amount of time. If you don’t like the taste of iodine in your water, you can also use iodine neutralizing tablets after you purify the water. If the taste of chlorine is too strong, just let the tablet sit in the water uncovered for a while to get rid of the taste. In this section, you’ll find reviews of the top 5 bet water purification pill products on the market today. You’ll see the pros and cons of each one and be better able to make the right decision to find the perfect option for you. For an affordable price, these water pills can give you a lot of peace of mind on your next hike. Keep them on hand and you’ll be able to enjoy fresh, clean drinking water in the space of about a half an hour. Lightweight and individually packaged for easy transport. Doesn’t have an unpleasant taste or aftertaste. These tablets only have a shelf life of 5 years and will need to be checked before use. Included directions may be difficult to understand. This is a popular brand of water treatment tablets that come packaged with both the iodine tablets and the neutralizing tablets that help remove the taste and color from your clean drinking water. It takes only 30 minutes for these pills to process your water and make it safe for human use. Purifier and neutralizer come packaged in separate lightweight bottles for easy transport. Two-pill system removes unwanted bad flavors from the water easily. May not be able to purify as much water at a time as other brands. May cause throat irritation in some users who are sensitive to chemicals like chlorine. Each one of these lightweight tablets is able to treat one liter of water, so you can get a lot of use out of a single box. Made with chlorine dioxide, these tablets are designed to remove the unpleasant taste that can go along with many other types of water purifiers. Individually wrapped for easy storage, packing, and safety. Very easy to use by simply opening the wrapper and adding to the water. Water may look yellowish after treatment, but even if so, it is still safe to use. Since these tablets are stronger than some, they may take longer than other tablets to purify water. This product is an affordable way to purify your water. The bottle itself only weighs a few ounces and won’t take up a lot of space. Best of all, if you don’t break the seal, you can stock up on these bottles and keep them in storage indefinitely until you’re ready to open them. Capable of purifying thousands of liters of water with one bottle. Directions are printed directly on the bottle, so there’s no paper to lose. Since this is made from iodine, it may stain skin or clothing if spilled. With these tablets, you can purify a liter of water per tab for quick and easy access to the right amount of clean drinking water every time. Each pill is kept in its own individually-wrapped package so you don’t have to worry about contamination issues. Feature a long shelf life and individual wrapping so you don’t have to worry about expiration issues. Tablets weigh almost nothing and take up very little space, even fitting into a pocket. May take up to four hours to purify water completely since this tablet is so powerful. May have a strong smell and taste to some users, although this can be remedied with neutralizing tablets. Picking the right purification tablets doesn’t have to be a challenge. With the tips listed in this buying guide, you’ll be able to make the right call and keep the perfect product on hand for whatever situation might come your way. Budgeting is always an important step when choosing any product. Some of these pills are more expensive than others, so it’s always a good idea to remember how much you can spend before you go shopping. However, keep in mind that more expensive options are sometimes better quality, so be sure to do your research. If you only take one or two big trips during the course of the year, you might want to go with a pill that’s available in a smaller quantity. You might not need more than 10 or 20 tablets to get you through your hiking season, and you wouldn’t want to buy something that will expire before your next trip. Do you live in a place where hurricanes, floods, or tornados are common? If so, be sure to keep your disaster kit filled with tablets that have a long shelf life. 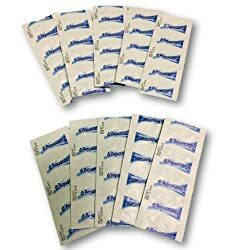 You can use the same ones for your hiking trip and save money by buying in bulk. Some people are allergic to iodine. If you have a shellfish allergy, you’re likely allergic to iodine too, so choose another type of tablet. If you have a sensitive throat or sinuses, try to stay away from pure chlorine tabs. Popular products will have a lot more reviews than unpopular ones. You can usually tell which brand names are the most trusted in the industry by seeing how many reviews have been left. Don’t be afraid to try new products that might not have a lot of feedback built up yet, though. So which is the best backpacking water filter tablet for you? You’ll need to go through the tips listed in the buying guide above to help you make the right choice. Rest assured that you’ll have a great product no matter which one of these you choose to go with. Remember to keep any emergency water purification you choose with you at all times when you’re hiking and camping. You never know when your bottled water supply might run out or you might not be able to make it to a dedicated clean water source. You’ll be safe and hydrated no matter what comes when you keep these tablets around! Thanks Nelson for such useful reviews. 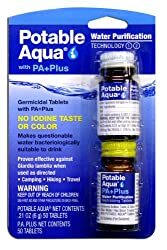 I have used Potable Aqua Water Purification Tablets with PA Plus several times for camping and backpacking. 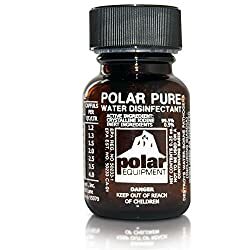 It works great from first hand experience, I’ve never gotten sick from the water I’ve treated with this. It may have a little chalky taste to it but at least you don’t have to worry about getting sick out on trail. I also keep a bottle of these in my emergency kit too. I had no idea that bottled water was so harmful. I am amazed! Thanks for offering so much advice. Will these , or are there brands of purification tablets that remove harmful minerals in water, such as arsenic? Do you if the above tables can be found in the UK?. I try amazon but no luck. Here they only sell a brand call Oasis.